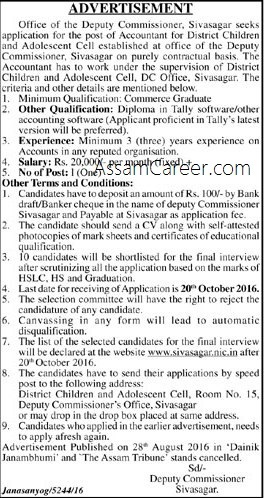 O/o Deputy Commissioner, Sivasagar seeks applications for the post of Accountant for District Children and Adolescent Cell established at office of the Deputy Commissioner, Sivasagar on purely contract basis. Educational Qualification: Commerce Graduate. Diploma in Tally Software or other accounting software. Experience: Minimum 3 years of experience on Accounts in any reputed organisation. Application Fee: Rs 100/- in the form DD/ Banker Cheque in the name of Deputy Commissioner, Sivasagar and payable at Sivasagar. District Children and Adolescent Cell, Room No 15, Deputy Commissioner Office, Sivasagar. or may drop in the drop box placed at the same address.